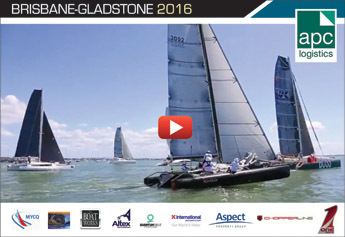 Sydney gave multihull enthusiasts some interesting treats this year, reports KEVIN GREEN. 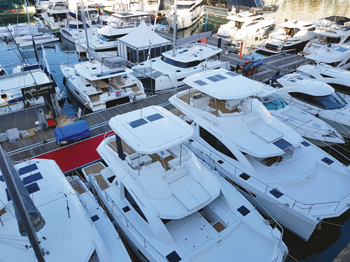 Ranging from affordable two-person beach cats to superyacht level catamarans, the Sydney Show offered something for most budgets. Given that most interest is in the mid-size cruising catamaran market, this was my first port of call at the Darling Harbour pontoons. 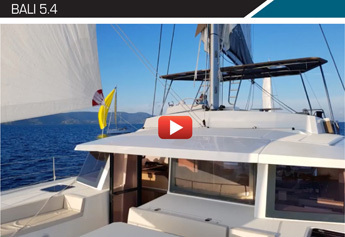 The Fountaine Pajot Astrea 42 is an ideal entry level sailig cat and has an impressive 12 layout options. Starting with the débutantes, the Fountaine Pajot Astrea 42 had visitors thronging to its three level layout, with all navigation done on the semi-flybridge, single helm area; safely away from the shaded aft deck dining area. 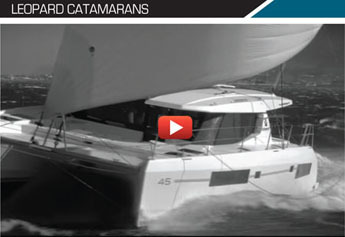 As the third member of the big triumvirate (with Lagoon and Leopard) this French cat showed its smoothness – both in the rounded hulls and saloon top – and in its ergonomics. 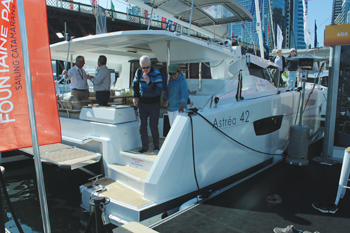 Available in an owner’s dedicated starboard hull version with three cabins or a charter model with a staggering 12 layout options for the bathrooms, the Astrea 42 can earn its living or be a family cruiser. 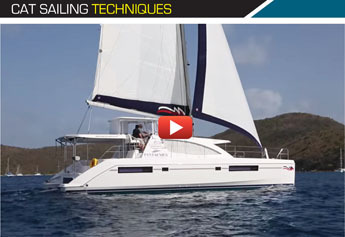 The simple sailplan of roller genoa and slab reefed main with easy boom access makes this a fairly user friendly 42 footer, especially when you consider the large foredeck cockpit and hydraulic swim platform option. Equally proficient was competitor Leopard’s new 50 that again benefits from the customer feedback that charter work allows. 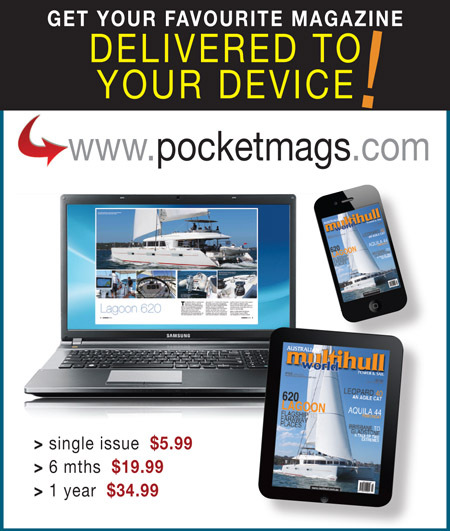 These will go into the Mooring’s fleets in vast numbers so you can try before you buy. The L50 is available in either the classic hard-top (called the Leopard 50P), or for the first time on a Leopard of this size, an optional flybridge lounge (Leopard 50L). The flybridge lounge should be big selling point on this boat. Above it, the rig has the regulation roller genoa and slab main with all lines going to the elevated cockpit. The layout includes three to five cabins (and an optional skipper’s cabin in the port bow) along with four to five heads. The aft owner’s suite shares the starboard hull with a guest cabin forward on the same side, as there’s plenty of volume. Dedicated staircases run to each starboard cabin where large ensuites add to the enjoyment of the L50. Over on port, it has the option of a cabin aft with an office or workshop forward and two heads amidships, or two cabins fore and aft with ensuites. Along the pontoons at The Multihull Group, a Lagoon 42 and 40 glistened in the sun (the 50 model is also destined for Australia). The new 40 is an ideal entry level with accoutrements for the newbie sailor to enjoy, such as the self-tacking jib and the elevated sailplan with controls on the saloon top for commanding views under way. 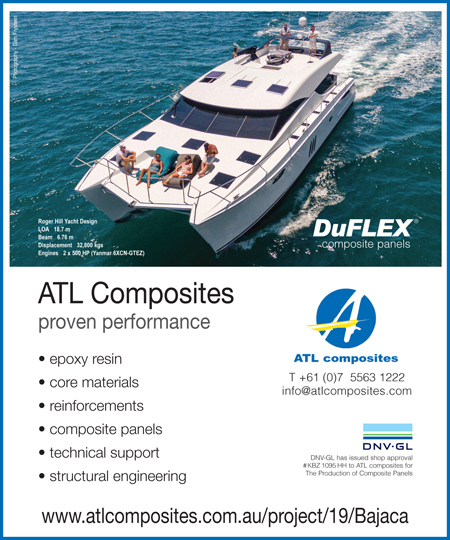 The famous VPLP design house has smoothed the exterior lines on this 40 footer, while inside the legendary brand volume allows for up to four cabins with ensuites. The saloon has the galley aft to serve the outside diners and the lounge is forward. Over at Australian builder Seawind, its new performance 1190S was on show, a boat that I enjoyed sea trialling. Sporting daggerboards and a performance sailplan, the 1190 pointed high and went well off the wind so has earned it’s ‘Sport’ moniker while inside are four cabins with comfortable saloon and sheltered aft deck. 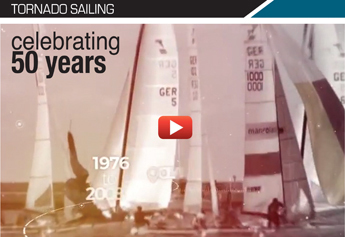 For the dedicated cruising sailor, their 1160 Lite, was also on show; a boat that is an evolution of the popular 1160. The Vietnam yard’s newest boat the Reichel Pugh designed Seawind 1600 has just reached Australia as well. French builder Catana’s Bali range continues to grow (a new Bali 4.1 debutes at Cannes in September) and Australian dealer Dream Yacht showed the Bali 4.3 off at Sydney. 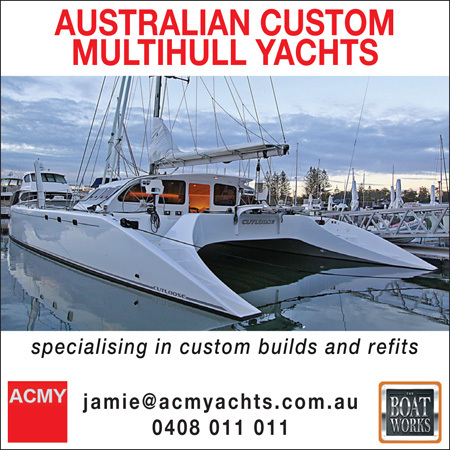 This has proved a popular boat locally – company boss Christophe Vanek and wife Amara told me they have several brokerage deals for these in their Whitsunday fleet right now. The Bali design is aimed at motor boaters as well as sailing enthusiasts thanks to some unique features. Top of the unique list was the electric saloon bulkhead that creates a weatherproof room on the aft deck but at the click of a button opens to allow alfresco dinning below the sheltered flybridge extension. Additional floor space is also created by the fold-down transom, which creates a large single level right through to the saloon. Sailing enthusiasts may rightly frown at the high boom and rig setup on the tall flybridge but the Bali range are hybrids that have wide appeal. 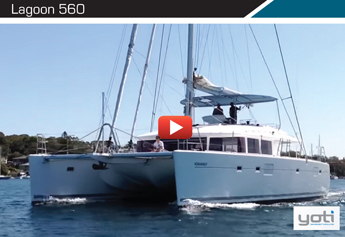 New arrival Heliotrope 48 was arguably the most striking of all these cruisers. 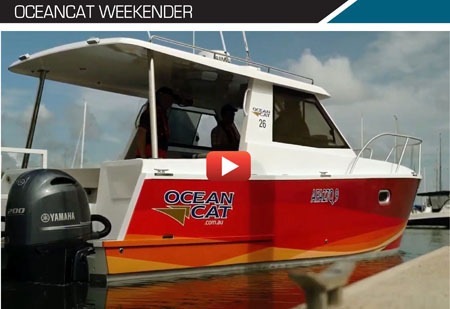 Built by the European owned Bakri Cono Shipyard in Thailand, dealer Vicsail in Sydney had commissioned this trawler catamaran for commercial operator Seabird Charters. Seabird owner Brett Foster kindly showed me around this large flybridge displacement cruiser that is in Australian survey (IE for 45 passengers). 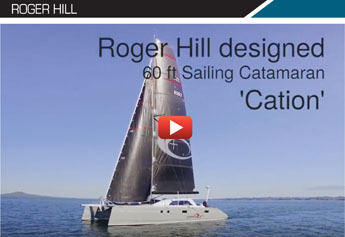 “I wanted a sailing cat but when I saw this boat I was really impressed,” said Brett. The gleaming standard of the woodwork and gelcoat also impressed me. “The boat is also for my wife and I so we wanted a really nice standard of finish, and that’s what we got,” added Brett. The stylish saloon has a spacious galley aft with plenty worktop space for charterers and large refrigeration. The comfy lounge forward is complemented by the vast flybridge that includes a cocktail bar. Powered by twin 230hp Steyr shaft drives, intended for economical cruising at 9.5kts (with max speed 15kts), this hull #2 of the Heliotrope 48 is aimed at the premium end of the day charter market. 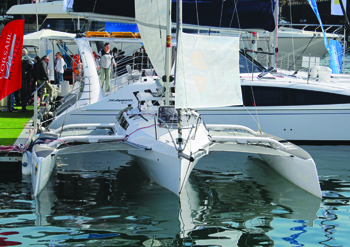 Aesthetics are very contemporary, reflecting the latest European design techniques and systems include the digital Czone backbone to complete a thoroughly modern cruising catamaran. Beach cats like the Hobie range are fun boats but portability can be a problem so they brought out their Island range a few years ago. 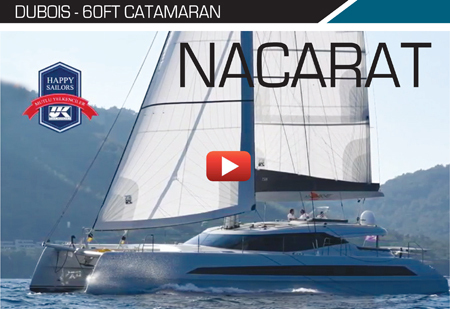 Austrian builder Xcat has taken note of this with a range of multisport craft that includes this lightweight (74kg) catamaran that disassembles into a few bags. 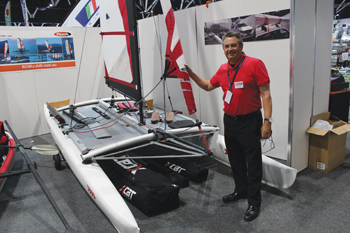 A car topper with a difference – this Austrian made Xcat is 5m, can be rowed and only weights 74kg, so you can see why importer Terry Smith from RowonAir is smiling. 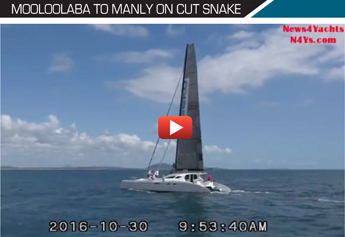 Those of us who enjoy small craft adventuring and RAID regattas will be interested in this $14k. 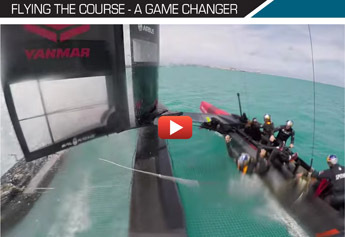 Xcat that is very well made and able to be rowed and sailed. 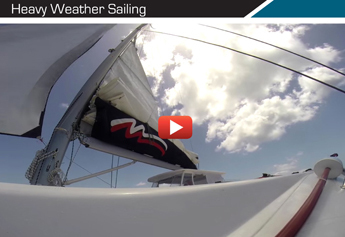 The modest sailplan has a roller genoa and windsurfer styled mainsail. These are also used in one-design European fleets. Its plastic hulls are perhaps a wee bit low in volume but intended to be versatile ie. for fast rowing when the wind disappears. It also has an outboard bracket. Sydney dealer Terry Smith from RowonAir has imported this boat along with an innovative range of forward facing rowing sculls. 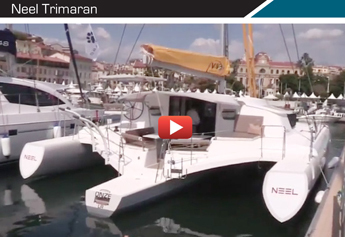 The Seawind 1160 Lite has outboards and has sold well while smaller sibling, the Corsair 760 is a trailerable trimaran. 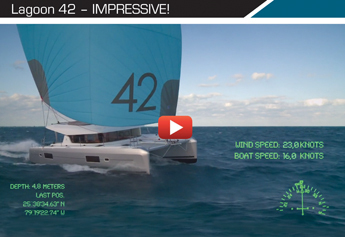 The performance monohull sailor looking at at a multi for the first time might consider the Dragonfly trimaran, a well established Danish design that’s been selling since 2008 and a former European Yacht of the Year. At the Sydney Show Dragonfly expert David Stiles from TMG showed me the patented folding ama system – that allows this 35 footer to be motored with them folded. Inside is a small but tall saloon with double berth forward and quarter berth aft. 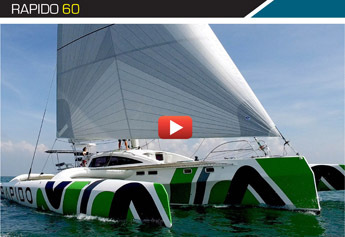 The advantage of trimarans is their centralised stability so all weight is here; a major reason why the grand prix ones like the ORMA 60/70’s are often the fastest boats around the globe. The downside of the Dragonfly is its cost so if your budget is more modest Corsair’s new 970 Cruze (31ft) is an ideal starter boat, with the performance of the racing C31 but with the cruising comforts of the larger 37. Power comes from a rotating wing mast and downwind asymmetric or screacher. 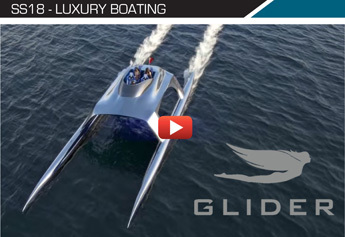 Below, the owner has the aft with a guest cabin forward. Between is a small head forward with starboard side galley and dinette table alongside. The brand’s toughness was shown by a successful voyage through the fabled Northwest Passage on a C31 so these folding boats built in Vietnam by owner Seawind have shown their mettle.